Anaheim, CA – Bluefin, the leading North American distributor of toys, collectibles, and hobby merchandise from Japan, Hong Kong and more, returns to San Diego, CA this month with a special collection of exclusive products from Bandai, Bandai Hobby and Tamashii Nations that will available for purchase at the 2016 San Diego Comic-Con International. Comic-Con International is one of the nation’s largest comic book, science fiction and pop culture events, and will take place July 20th–24th, 2016 at the San Diego Convention Center, in San Diego, CA. Complete details on Comic-Con are available at: www.comic-con.org. Bluefin’s Bandai and Bandai Hobby products will be located in Booth #401; Bluefin’s Tamashii Nation’s products will be located exclusively in Booth #3545. Bluefin is the official North American master distributor for Bandai, Bandai Hobby and Tamashii Nations. This year Bluefin is pleased to offer notable products for several legendary fan favorite properties including Godzilla, GunPla, Dragon Ball, Naruto, Sailor Moon, Star Wars, Teenage Mutant Ninja Turtles and Voltron. · S.H. Figuarts Dragon Ball Broly – Premium Color Edition - a very special Comic-Con exclusive dest8ned to become a collector’s item. Also set to be shown for the first time anywhere will be the new Bandai Soul of Chogokin Voltron which will be on display exclusively at Booth #3545. The latest addition to Bandai’s high-end brand for mecha toys celebrates the classic anime robot series will debut to retailers in December. The ultimate version of Godzilla from the movie ‘Godzilla vs. Destroyah’ where he burns up just before meltdown. Standing over 19” tall with a width of over 35” to the tip of his tail, this sizable rendering delivers some serious size to any Godzilla collection! Add him to your collection now before he melts away forever! A special Beargguy from the "Gundam Build Fighters" TV series made only for events, it is designed with the appearance of a Chinese wedding dress! Stickers are included to make different facial expressions. This very limited item will be available especially for San Diego Comic-Con on a limited 1 per person basis from Preview Night only until Saturday morning. Black Lady, the memorable dark version of Chibiusa, comes to S.H.Figuarts in possibly the most elegant figure design yet! Sailor Moon fans will recall how the Wiseman used his dark magic to bring about the evil Black Lady (and possibly the memorable badminton scene too). This magnificently wicked set includes the dark Luna-P ball and support base, the aforementioned badminton set (racket and shuttle), shawl, shawl support parts, special stage, interchangeable hands and interchangeable face parts. After tremendous anticipation, Tamashii Nations delivers the fifth addition to the popular S.H.Figuarts Naruto series. Next in line is Naruto Uzumaki as he appears in Sage Mode (“Sennin” Mode) after mastering the balance between his natural energy and chakra. Interchangeable faces are noticeably painted with the orange pigmentation patterned around the eyes, a look unique to the Naruto’s sage mode. The set includes interchangeable hands, interchangeable faces , kunai, and battle effect parts. Kakarot!!!! Kakarot!!!! KAKAROT!!!! Tamashii Nations’ 2016 SDCC Exclusive is S.H.Figuarts Broly Premium Color Edition! The Legendary Super Saiyan Broly is arrives with superior quality paint never seen before!! Broly comes in at approximately 7.5 inches high, taller than other S.H.Figuarts Dragon Ball characters. His overwhelming power and muscular build are captured with a meticulous sculpt. Recreate some of Broly’s more infamous scenes with the additional facial expression parts, one smirking maniacally and the other screaming berserk-like. Additional parts include three unique energy-sphere effect parts and interchangeable hand pieces. The artillery packed Teppo Ashigaru Sandtrooper is back with a new and highly exclusive black pauldron design! The right pauldron (shoulder armor) is charcoal black and indicates that this feudal Sandtrooper of the Galactic Republic (or in this case perhaps a Galactic Han) is of enlisted status. 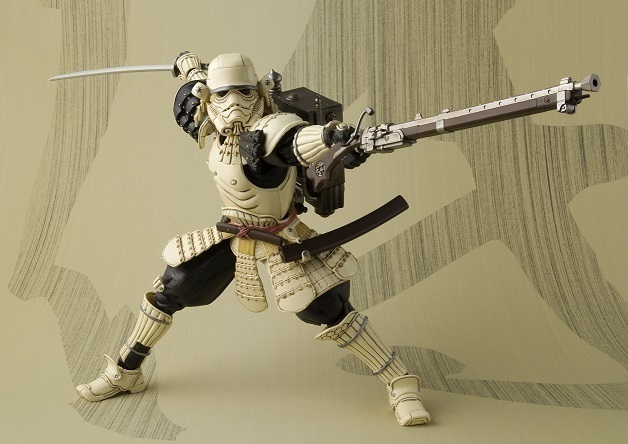 The Sandtrooper Special Version comes with two gun powder type rifles and a Japanese katana sword ready for battle. The special backpack is designed with meticulous detail and finished with a rusty look. Flexible material makes posing the Sandtrooper holding a firearm a breeze. The set includes interchangeable hands (x6), blaster rifles (small and large), Japanese katana set, backpack, and interchangeable white pauldron.